Located just over 15 miles outside of the English hub of Manchester, Macclesfield was the home of the late singer and lyricist Ian Curtis, front man for post-punk pioneers Joy Division. The ashes of Curtis are now buried minutes away from where he lived, at the Macclesfield Cemetery and Crematorium. Though it has been over 30 years since he took his life, an estimated 2,000 people annually make their way to the small, quaint Northern town, on a quest to pay homage to Curtis. Traveling from as far-flung destinations as Japan, Texas and Australia, fans embark on sonic pilgrimages to walk the streets that inspired Curtis, see the house where he once inhabited- and pay their respects at Curtis’s Memorial Stone. As a part of her PhD research, photographer Jennifer Otter captured images of the fans, flowers and fauna every month over the course of a year at the Curtis 'kerb.' 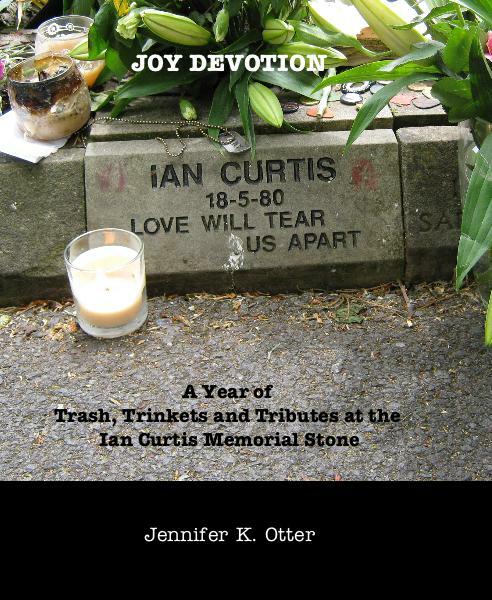 Joy Devotion: A Year of Trash, Trinkets and Tributes at the Ian Curtis Memorial Stone documents the ever-changing homages to the singer and provides unique insight into music, community and memory.